The summer moon often plays many tricks on your eyes. When rises in the east it appears very large when it first peaks over the horizon. This is what is referred to as the moon illusion. When you first see the moon it looks incredibly big to the human eye but oddly enough cameras don’t see it but your eyes do; this is the real illusion. No matter what position in the sky the moon is it is always the exact same size, as of why this illusion occurs.. Scientist are still not 100% sure. One thingis for sure, the best time to view this illusion is when the moon first rise! 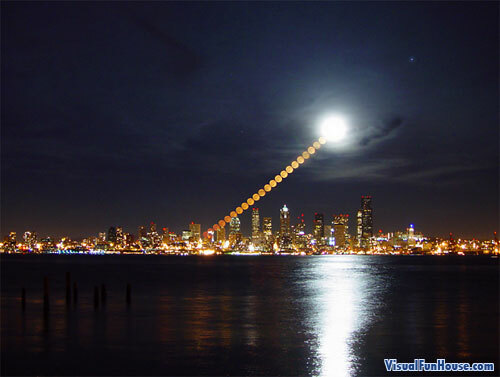 This photo was taken by Shay Stephens, it is a time lapse sequence of the moon rising over Seattle. My belief is that the big moon effect (when rising) is due to the fact that we have other objects in the near view to compare the size of the moon to (buildings, trees, fields, etc). When the moon is close to things we see, we just really realize how big that darn moon is! I’ve never noticed the moon appearing larger or smaller as the night goes by. My opinion is when the moon is near the horizon we are looking through the atmosphere of the earth which magnifies the moon. Kind of like looking at an object in a glass of water. The moon is there for a reason. If anyone alive today on earth has never seen it, I’d like to know whom. PEOPLE WITH VISION.